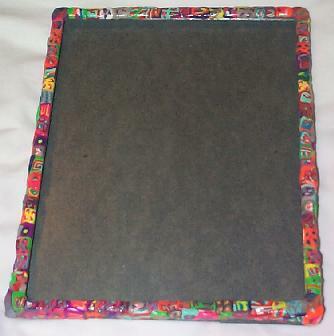 Chadis Crafts and Kippot - Sculpey/Friendly Clay Picture Frames. 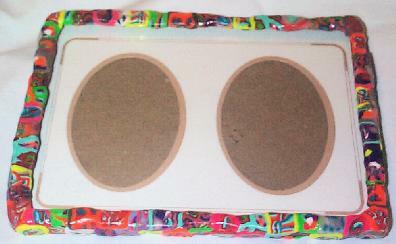 5 by 7 frame or use double insert mat. Metallic Gold wash. 5 by 7 frame. Most frames can be hung or stand. Friendly Clay Professional slices are shrunk and applied onto a base of Sculpey Clay. 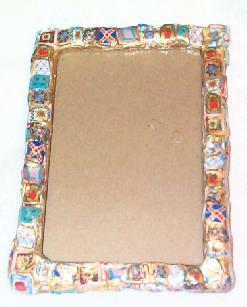 The clay is put on top of a metal Picture Frame. These frames are unique and are of the folk art look. Squares/cane slices of many different tiles and sizes are used. Apples, sunflowers, checkers and more. Price Special= $20 each plus shipping. Friendly Clay is a POLYMER CLAY just like Sculpey and Fimo and is not to be confused with Friendly Plastic which when heated stays a meltable plastic. Joseph's Coat of Many Color Series. 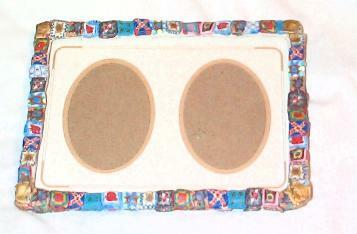 5 by 7 Frame can be used sideways with double picture matt. Also can be used as a 5 by 7 standing in either direction. Named for Joseph's Coat of many Colors. Hand made Sculpey Clay Tiles/designs are molded over a metal frame. Available with or without a gold wash.
Special Price = $20 for 5 by 7 plus shipping. $30.00 each plus shipping for 8 by 12. Other styles available by special order. Other Jacob pattern series available in Mezzuzahs, dreidels and more.